[EAN: 9780483701847], Neubuch, [PU: Forgotten Books, United States], Language: English. Brand new Book. 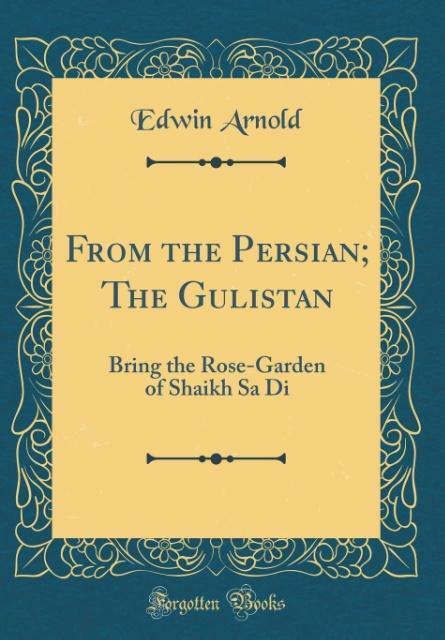 Excerpt from From the Persian; The Gulistan: Bring the Rose-Garden of Shaikh Sa Di A brilliant romance might be made out of his life! Born at Shiraz in a.d. 1193, and educated at the famous College Of Baghdad, he set himself in his man hood, with a keen and genial curiosity, to see and understand the world. Pious, albeit shrewd and philosophical, he made. About the Publisher Forgotten Books publishes hundreds of thousands of rare and classic books. Find more at This book is a reproduction of an important historical work. Forgotten Books uses state-of-the-art technology to digitally reconstruct the work, preserving the original format whilst repairing imperfections present in the aged copy. In rare cases, an imperfection in the original, such as a blemish or missing page, may be replicated in our edition. We do, however, repair the vast majority of imperfections successfully; any imperfections that remain are intentionally left to preserve the state of such historical works. ***** Print on Demand *****.